Ben Marcin on “Last House Standing”: One of the architectural quirks of certain cities on the eastern seaboard of the U.S. is the solo row house. 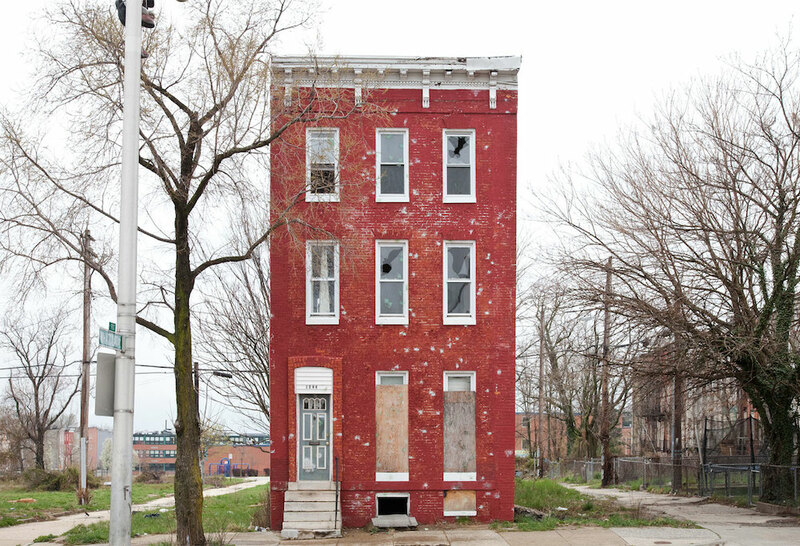 Standing alone, in some of the most distressed neighborhoods, these nineteenth-century structures were once attached to similar row houses that made up entire city blocks. Time and major demographic changes have resulted in the decay and demolition of many such blocks of row houses. Occasionally, one house is spared — literally cut off from its neighbors and left to the elements with whatever time it has left. My interest in these solitary buildings is not only in their ghostly beauty but in their odd, almost defiant, placement in the urban landscape. Often three stories high, they were clearly not designed to stand alone like this. Many details that might not be noticed in a homogeneous row of twenty attached row houses become apparent when everything else has been torn down. And then there's the lingering question of why a single row house was allowed to remain upright. Still retaining traces of its former glory, the last house standing is often still occupied. Most of Ben Marcin’s photographic essays explore the idea of home and the passing of time. “Last House Standing” and “The Camps” have received wide press both nationally and abroad (The Paris Review, iGnant, La Repubblica, Slate, Wired Magazine). More recently, Marcin has been exploring the myriad structures of the urban core in series like Towers, Streets and Stairwells. His photographs have been shown at a number of national galleries and venues including the Baltimore Museum of Art; the Delaware Art Museum; The Griffin Museum of Photography in Winchester, MA; The Center for Fine Art Photography in Ft. Collins, CO; The Photographic Resource Center in Boston; and the Houston Center for Photography. Last House Standing (And Other Stories) was featured in a 2014 solo exhibit at the C. Grimaldis Gallery in Baltimore. Marcin's work is also in several important collections including the Baltimore Museum of Art. He is represented by the C. Grimaldis Gallery in Baltimore, Maryland.